Most often designers are unable to battle with the rising need of impeccable mobile email design. The significance of mobile email is growing rapidly with the changing times. The key considerations for marketer is to provide the same experience to all the viewers irrespective of the screen sizes of the mobiles and it should not result into sad design views. Marketers are battling out to create and launch successful responsive mobile friendly email communications keeping in mind every small factor this 2013! It would be a treat to watch if 75% of companies who do not optimize emails for mobile start doing it. As more people tend to respond and read emails over mobile devices, there is a high time marketers should create responsive mobile emails to increase the opens, clickthroughs and responses. – 43% of Emails are read over the phones and this is expected to rise to more than 50% by the end of 2013! – 73% of the people from USA check their emails on smartphones. – 43% of mobile email users check their emails four or more times per day, compared to only 29% of those who do not use mobile email. – Mobile or Smart-phone usage is more prevalent in the morning and evening hours. It was amazing to know that iPhone leads the market share amongst all major email clients. Infographic provides us a brief on the market share of various email clients Calculated from 205 million opens tracked by Litmus Email Analytics in April 2013. Many of the companies have yet not recognized the importance of responsive mobile email because they don’t know what exactly is the talk of the town? 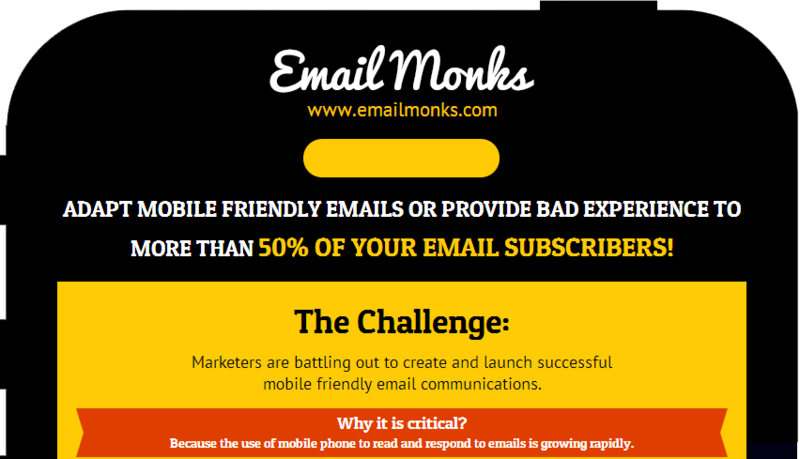 This infographic from Email Monks also defines responsive mobile email in easy yet effective way. According to the infographic, Responsive email design uses CSS3 media queries to display different layouts of an email depending on the size of the viewing screen. You can display or hide elements for a true mobile experience. I am Mathews Johnson and I work as a creative consultant with Email Monks. Email Monks is a superfast yet cost effective mobile friendly email design and coding services provider. Email Monks also converts design to Email HTML in as less as 8 hours.